These mango margaritas with hints of vanilla and orange blossom are a tropical escape right in your backyard. Thank you Nielsen-Massey for sponsoring this recipe. As usual, all my opinions are 100% mine and I love sharing with you brands/products I use and enjoy in my kitchen. You guys we are starting this week with a cocktail!! 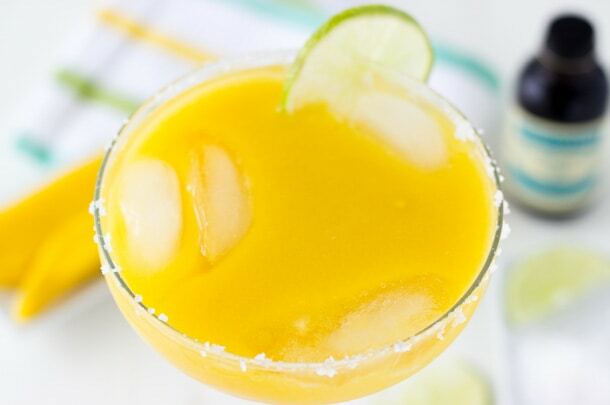 A mango margarita that’s tropical in flavors and refreshing to the touch. Why, yes this is just as delicious without the tequila although the hubs thinks the tequila brings it over the edge (Thank you resident cocktail taster…for three more weeks). I was looking through my recipe index recently at the tropical recipes I have and noticed that I only have one or two mango recipes. And that’s unacceptable given that I LOVE mangoes beyond normal. I grew up with mango trees in my backyard in Sierra Leone and during the raining season we enjoyed a bounty of fresh ripe mangoes right off the trees. It was a nightly tradition where we will all sit around the table with a bushel of freshly picked mangoes in front us and we will just eat. Eat until the juices run down our arms. Sadly mangoes on that level of sweetness and juiciness seem to come from tropical places only and I have missed that living on the north end of the US. But I will settle for whatever ones I can get over the summer that are ripe. OK back to these mango margaritas that are staring us in the face. 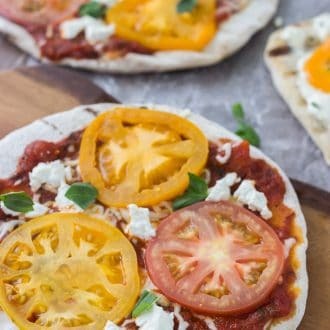 They are pretty simple really but the flavors are amazing. Combining fresh mango puree with lime juice, simple sugar syrup, Nielsey-Massey’s Tahitian Vanilla extract with floral and fruity hints and a dash of their Orange Blossom water brings together a wonderful blended cocktail that is refreshing, fruity and tropical. Of course you can leave out the tequila and still enjoy all these flavors but for an adult version, be sure to add the tequila and some sugar-lime zest to the rim of the glass. Dip glasses in water. Combine the sugar and lime zest. Lightly sugar the rim of margarita glasses by dipping them in the sugar and lime zest. Add a few ice cubes to each glass and set aside. In a blender, combine all the ingredients and blend until smooth. Pour over ice into glasses. Garnish with fresh limes. 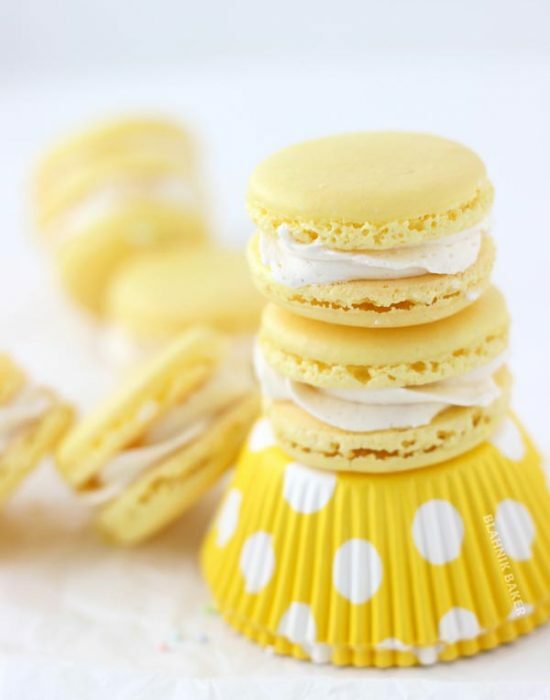 For more recipe ideas, be sure to follow Nielsen-Massey on Facebook, Twitter and Pinterest. I have never tried such margaritas! Since there is mango I would love them no doubt! The color of these margaritas is gorgeous! How lucky to grow up with mango trees in your backyard! 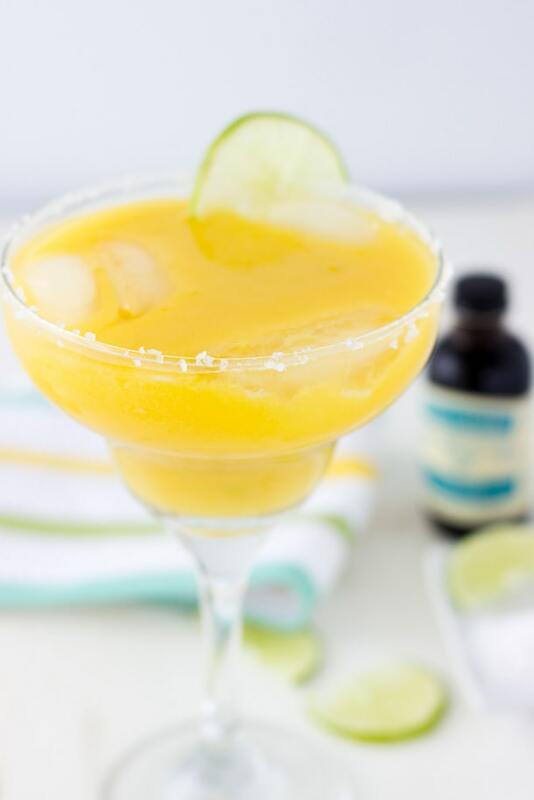 Mangoes are one of my favorite fruits, and these margaritas sound amazing with the mango and vanilla. What a great idea to use some vanilla in a cocktail! These look great. Must have been awesome to have a mango tree right in the yard. They are one of my favorites too! Love the gorgeous marg. It’s like a beam of sunshine! I love that..a beam of sunshine!! We all need that right?? 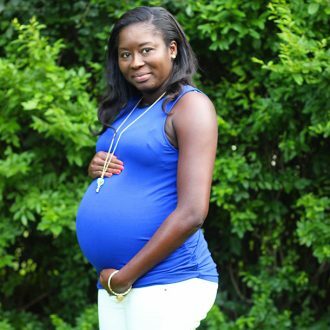 Shout out to Sierra Leone! Every summer my husband makes it known that Sierra Leone has THE BEST MANGOES! He mentioned the juice streaming down your arm! I can’t wait to visit Sierra Leone! Thanks for the memories! Sierra Leone with the mango trees-here I come! Pinned! I am SO SO down for margaritas on a Monday! 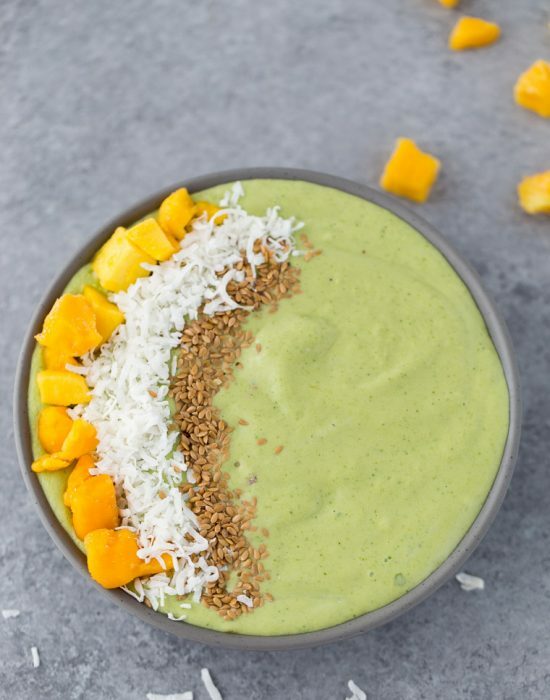 I have been craving mangoes lately, and this is EXACTLY how I want to get my fix! Pinned! Thanks Taylor!! It makes Mondays so much better!! Let’s drink this all day long!! I love this, Z!!!! Perfect for summer!!! I so want to sip on one now!!! I wanna try the Nielsen Massey Orange Blossom Water!!! delicious!!!! The orange blossom water is delicious!!! I can’t wait to bake with it…was thinking of adding it to a sweet bread soon! Thanks Medha!! It really was amazing and of course I didn’t appreciate it until I didn’t have it anymore. Putting vanilla in a margarita is THE BEST idea! I love super flavorful cocktails, and this totally fits the bill! Mangos are a huge favorite of ours — my boys want me to buy them and cut them up for them like they’re going out of style. I can’t imagine how wonderful they must’ve been for you growing up! 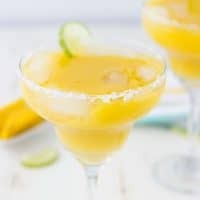 This margarita is so sunny and bright and is the perfect cocktail in my opinion! How gorgeous! I just love mangoes! Your photography is always stunning Zainab! Only 3 more weeks? How exciting! I love this margarita, especially that orange blossom water, that sounds absolutely divine! That must have been so awesome to have a mango tree in your backyard! We love mangoes so much! Love that you made margaritas, the color is beautiful! I absolutely love this. And the touch of vanilla is genius! It was amazing looking back now!! 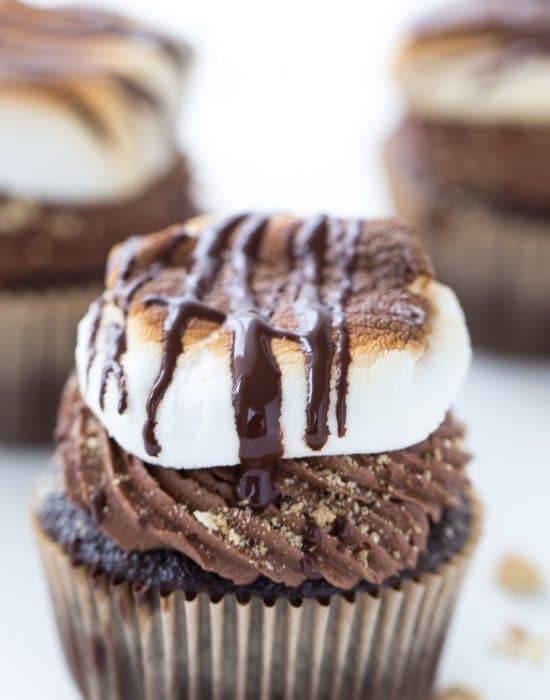 Oh la laaaa….everyone will be so happy if we serve this for our next gathering. 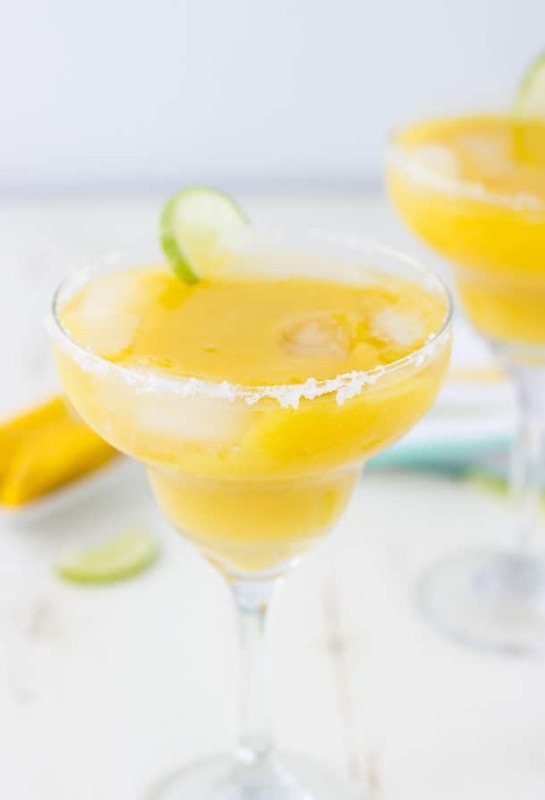 We love mangoes and making it into margaritas is perfect for Summer time. We love mangoes but only eat them in salads, I bet these are amazing in a margarita!! I love mango margaritas! I want to make a pitcher and be completely selfish with it! 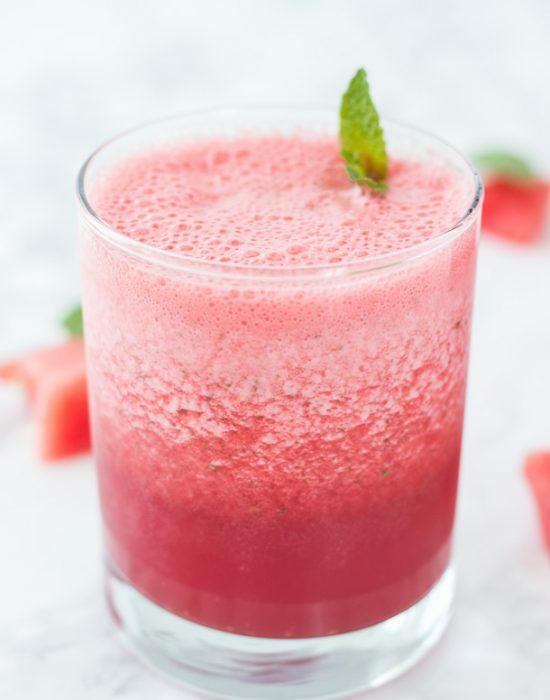 This is such a refreshing beverage for summer! Zainab, these sound delightful! Lovin’ the mangoes and I love the hint of vanilla and orange blossom water! Three more weeks!! Eeeek!! We are down to two now! You’re such a bright ray of sunshine, Zainab–seriously, just like these mangoes! I’m in love. Sending my best your way!! I totally get that — some fruit is just not the same up here! These are so perfect and refreshing!